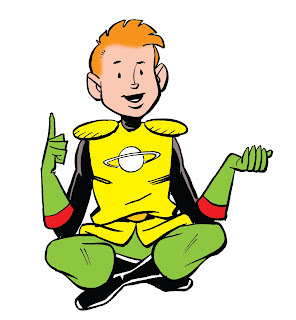 Nothing profound today, I just wanted to post some drawings of the Cosmic Kid I did recently for a little side project (not the Scholastic edition--I'm told that's already off to the printer!). 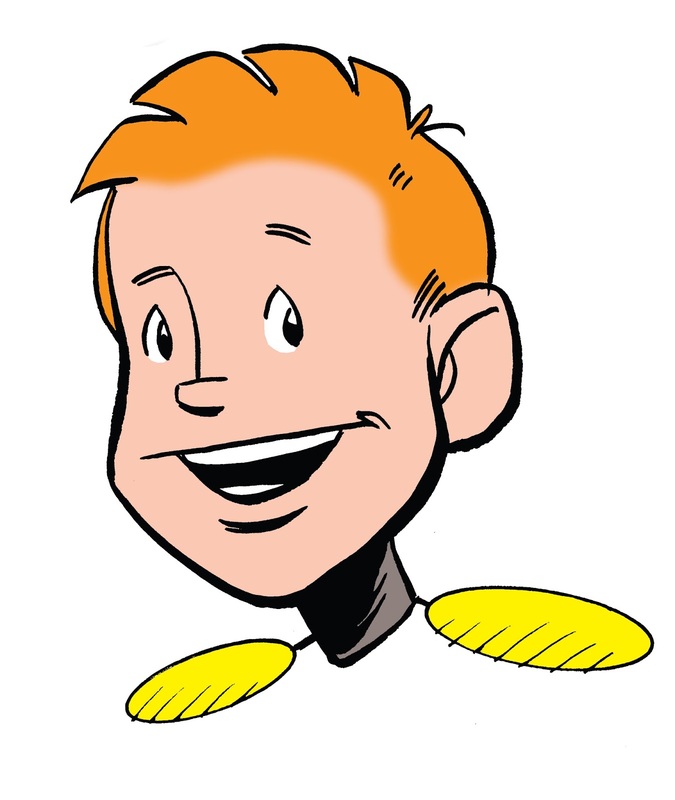 I really enjoy drawing this character--unlike Cap Crater, whom I enjoy drawing less because I made some--well, I don't want to say "poor decisions," but let's say "less than optimal choices"--when I designed him. 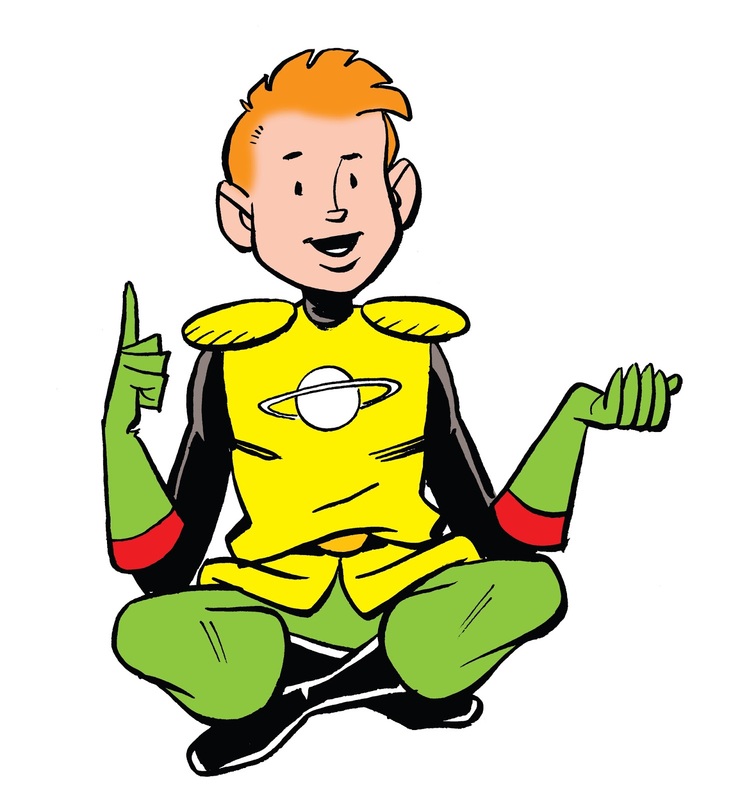 The Cosmic Kid is always expressive, energetic, and has different shapes and textures in his uniform for me to play with. I like drawing his gray undershirt and leather boots. I like drawing his Saturn emblem. It's always fun to revisit him. 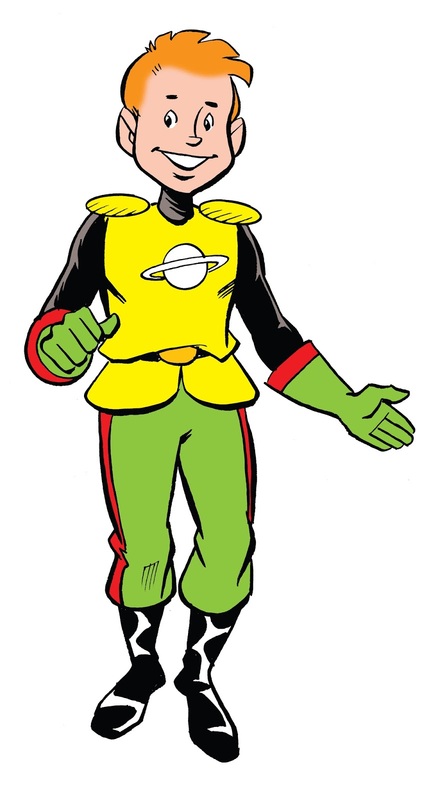 WHTTWOT was recent enough that I can always dash off a Cap Crater or Cosmic Kid without reference. 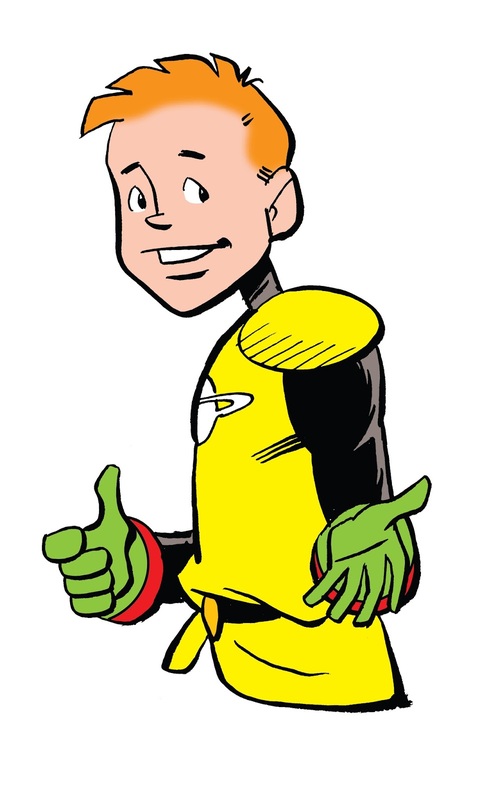 If I had to draw any other characters from the book, I'd probably take a quick look just to remind myself how I drew them. Sketching the characters from Mom's Cancer, as I recently did when signing books at the Medical Examinations Conference at UC Riverside, is more challenging both because I haven't drawn them in a while and I don't exactly draw like that anymore. No one else would notice the difference (I trust), but I kind of have to rewind my brain and think, "how would I have drawn them then?" In fact, embarrassing secret: before the Riverside signing I practiced so that I could casually dash off a sketch like it was no big thing. I worked at that. 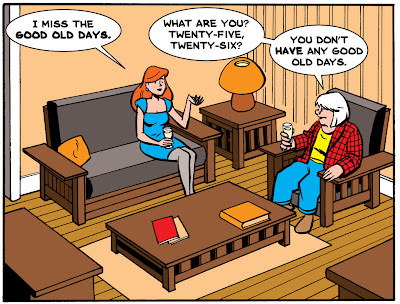 There's another good reason to put a lot of thought and care into designing your comics characters: you may be living with them much longer than you think. In my mind I think I write "How To" posts all the time. If you looked through seven years of archives on both this blog and its predecessor, you'd probably find dozens of them. However, I recently realized it's actually been a long time since I've described my overall cartooning process in any detail, and it's evolved a bit. So once more unto the breach. First Critical Caveat: This is just my way. It's not the right way. There is no right way; whatever tools and methods work for you are fine with me. In fact, in our digital age in which increasing numbers of cartoonists work entirely in pixels on Wacom tablets and Intuos screens, my dedication to paper and ink makes me a dinosaur in denial that an asteroid has hit. My answer is the same as MAD Magazine cartoonist Tom Richmond's: paper and ink are fun. I enjoy the craft of creating a physical thing. Why would I give up the best part of the job? What I can testify is that I've made a lot of mistakes, massaged out a lot of bugs, and this method works for producing publication-ready comic art. Revise the recipe to suit your taste. My paper is 2-ply Bristol board, typically from Strathmore. For this project, my original page size is 27 x 42 cm (about 10.5 x 16.5 inches). Most artists draw 1.5 to 2 times larger than their comics' ultimate printed size, which in this case I don't know; I chose that size because its proportions are standard and it's the largest that fits on my scanner. My India ink is Dr. Ph. Martin's "Black Star." I used to use Higgins ink, but either their formula changed or my standards improved, because I find it unusable now. Too thin and blotchy. Martin's costs more but it's got a great consistency and covers paper like tar covers a road. I typically write my comics first. It's an informal script, but in form and content resembles a screenplay: simple descriptions of settings and action, plus dialog. Sometimes a little doodle to remind me what I'm imagining. Not everyone scripts first. Some savants just start drawing and see what story comes out. I can't do that and barely comprehend it, but if you're a "pictures first" type of cartoonist you have my respect and admiration. I'll often but not always do thumbnails--very rough sketches that lay out the page and the action in each panel. Sometimes the script is clear enough that I already see the page in my head and can go straight from script to penciling. 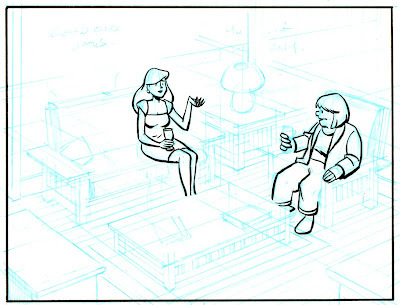 Comics are traditionally drawn in pencil first, then gone over with black ink. This method is an artifact of century-old printing technology and isn't really necessary anymore, but it still works and is what I do. You can just use a plain ol' No. 2 graphite pencil, but you'll have to erase your lines later. I don't like to erase. It takes time and smudges ink lines. Instead, I use light blue pencil, another artifact of obsolete technology. In the old days of shooting Photostats, light blue became invisible so you didn't need to erase it. Even today, scanners and photocopiers don't reproduce it well, so it can still serve much the same purpose. In this panel, two neighbors are having a glass of wine after work. First thing I want to point out, and this is very important: my top priority when composing a panel is figuring out where the words go. A lot of beginning cartoonists don't know this: THE WORDS GO FIRST. Blocks of text draw the reader's eye through the page, and their placement can make the reading experience an effortless joy or a hopeless muddle. It's not evident in the above scan, but I've sketched out a few key words from the script in the open space near the top of the panel (the one at top left reads "good old days") and am very aware of how much space the text will need. Second thing I want to point out are the perspective lines. 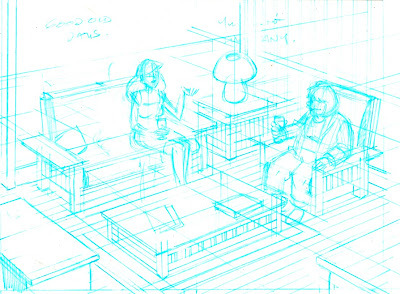 They all go toward two vanishing points far off-panel (actually, far off the edge of the paper as well). 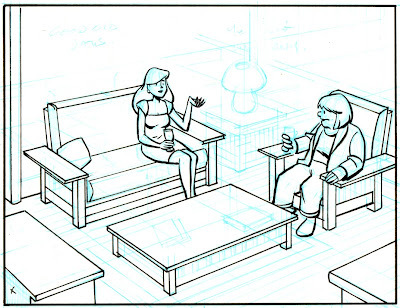 I don't lay out a perspective grid for every panel, but in this case--a medium-long shot that shows walls, a floor, furniture, and characters occupying that space--it's essential. 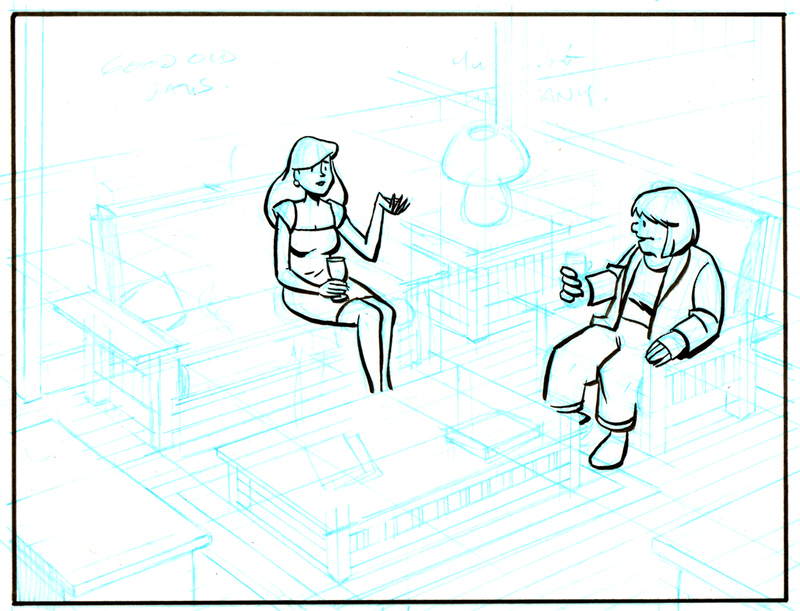 Whenever I have trouble drawing something and it just isn't "working," I find that about half the time I've messed up my perspective somehow. This panel is unusual in that I brushed very little of it. 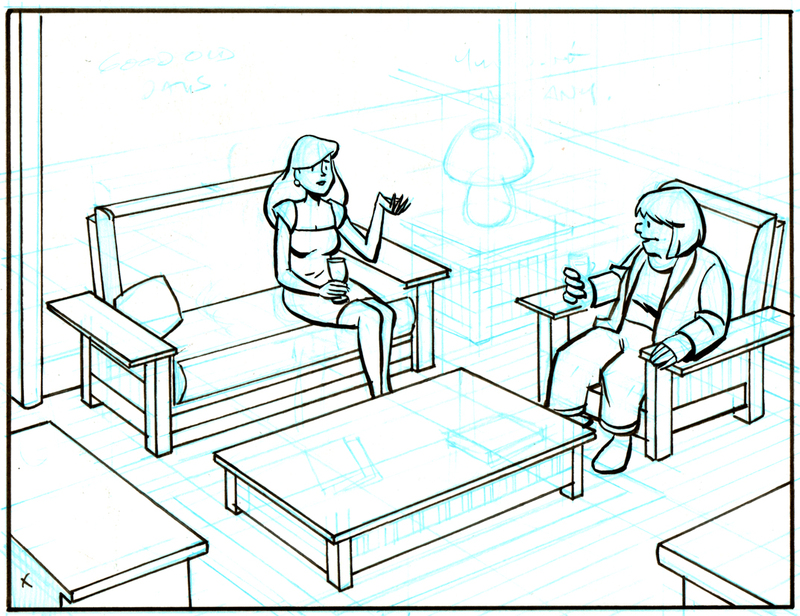 Generally I ink at least half of every page via brush, but this panel has a lot of fine straight lines that'll obviously require a pen. Sometimes I use a crow-quill dip pen, but in this case I'll use Pigma Micron pens in various sizes to complete the inking (I'm not a shill for Microns, but they make dark, colorfast lines that work well). Here's an intermediate step, in which I've defined the major shapes to make sure they're right before getting bogged down in fiddly bits. At last I join the 21st Century and scan the art into Photoshop. First step is general clean-up: smudges, smears, and other stuff that would've been fixed with white paint and rubber cement in the old days. I think you have to be very careful here. On a computer, it's very easy to zoom in on every microscopic spot and "fix" it until you've fixed all the spontaneity and life out of it. 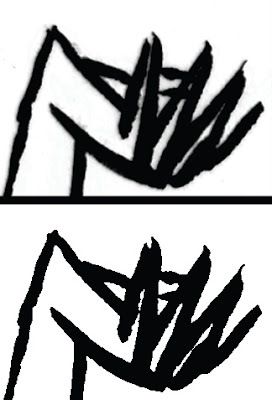 In my opinion, it's vital that the art still looks like it was done by a human rather than a robot. Know when to quit. 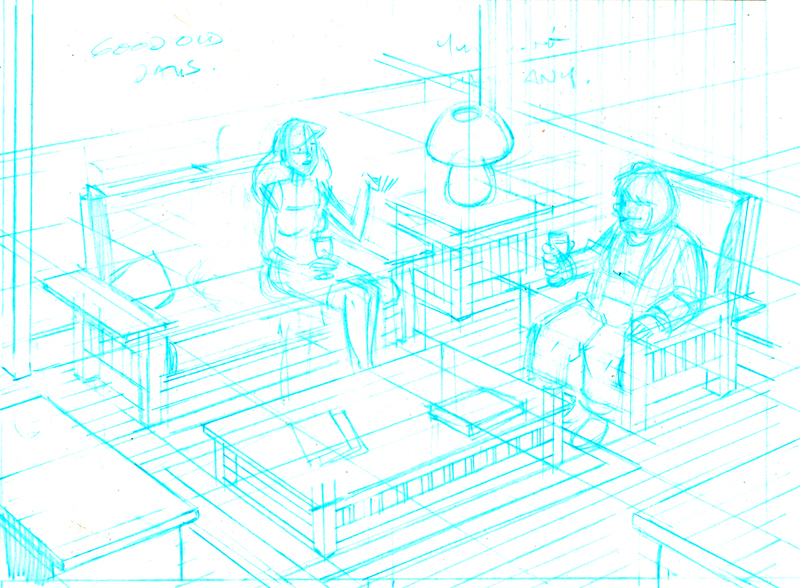 At this point, I also use Photoshop to erase my blue pencil lines. Here's some wisdom I learned from hard experience, and led to the Second-Best Advice I Ever Gave: when you scan your work into Photoshop, scan it at the highest resolution your computer can handle without choking. At a minimum, 600 dpi. I work at 900 dpi, but that's with original art drawn larger than the final art will be printed at, so it's really more like 1200 dpi. One reason is that, even if you're just doing a webcomic that'll be posted online at 72 dpi, you may need better-quality images down the road. Remastering original art is a painful waste of time. Here's another reason. At this stage, I do something that's hard to follow if you're not playing along (so don't worry if you're not): I convert my scan to bitmap (50% Threshold) and then back to CMYK mode. Why? Because converting to bitmap changes every pixel to either black or white--no grays. This gives me very crisp black lines that print and color very cleanly. 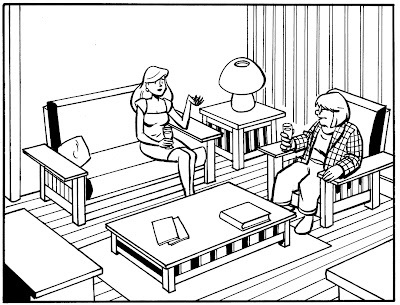 As shown in the comparison below, where I've zoomed in to look at the hand of the woman on the sofa, it also gives lines a zig-zag sawtooth pattern. Scanning at high resolution makes the sawtooth disappear when you pull back. Before (top) and after (bottom) converting back and forth to bitmap mode. Now: Words. 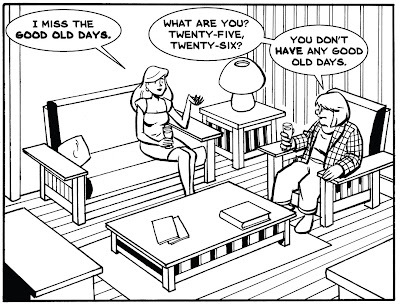 As I said, in the old days, the words would've been inked first, directly on the original art. That's how I did Mom's Cancer. That's real cartooning and I respect it. However, here's what I learned on Mom's Cancer: it also makes editing very difficult. 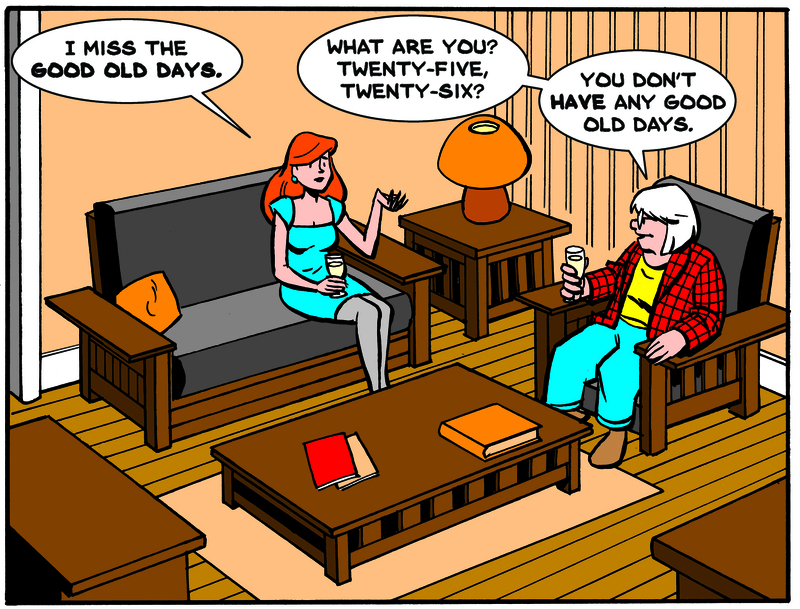 Imagine you want to move a word balloon, change or delete a bit of dialog, or just fix a typo. 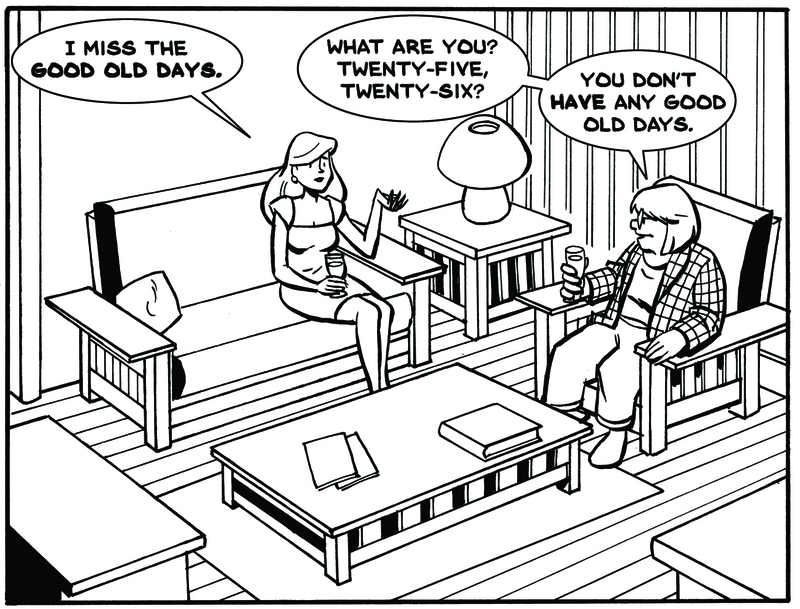 With the text and balloons on the original art, you might have to redraw an entire panel. And that's not even considering deleting all the words to get the pages ready for foreign translations! With some regret, I decided that digital lettering was the way to go on Whatever Happened to the World of Tomorrow, and haven't looked back. I scanned samples of my own hand lettering from Mom's Cancer and used a program called FontCreator (not a plug, there are others) to turn them into a computer font, which I've used since. Balloons go on a separate Photoshop layer in a process that isn't worth describing. 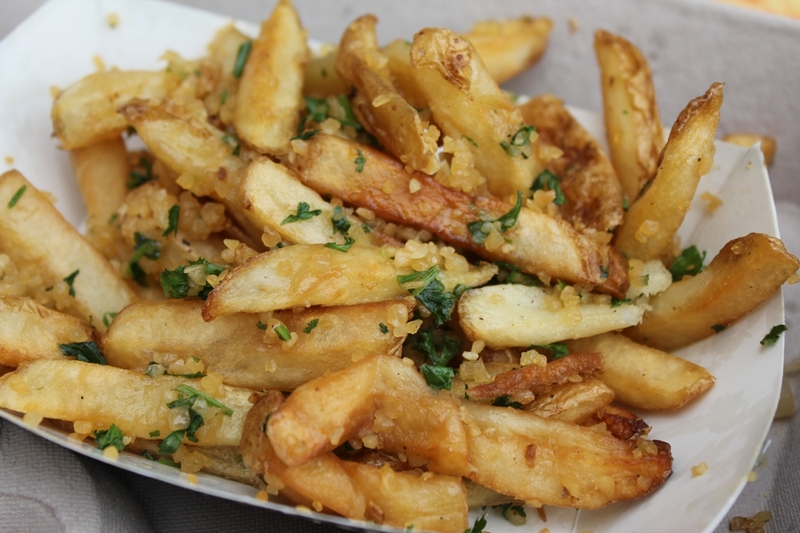 All easily editable. Finally, Coloring. Again, in Photoshop*. There are some technical aspects of preparing art for color printing that aren't worth getting into. Most importantly, I recommend coloring your work in CMYK (cyan, magenta, yellow, black) mode rather than RGB (red, green, blue) mode because CMYK works best for printing inks on paper while RGB works best for shooting electrons at a computer monitor. Unless you're absolutely certain that your artwork will only ever be seen on a screen, use CMYK or brace for a world of hurt later. This coloring is quick and dirty, not final; if this panel ever sees print, it might look quite different. I would go to some effort to create a palette for every character and location (which I haven't done here) to give each a characteristic look and feel. My goal is to have the colors communicate something about the person and place, and lead your eye where I want you to look. A lot of colorists take full advantage of Photoshop to do highlights, shading, blending, and similar effects (lens flare!). I do some of that but not a lot. My comics aesthetic leans toward a limited palette of mostly flat colors. To me that says "comics." But that's just me. That's pretty much how she goes. It may seem like there's a lot to it, but you get into a rhythm and it flows pretty easily. I enjoy the change of pace moving back and forth between the drawing board and computer. At the end of the day you can say you turned white paper and black ink into something that didn't exist yesterday, which can be a very gratifying (or frustrating or depressing or exhilarating) feeling. Four Harvey Noms for "Team Cul de Sac"
Nice news from Baltimore this morning: Team Cul de Sac: Cartoonists Draw the Line at Parkinson's, a book I was proud to be a small part of (specifically, about 1/150th a part), has been nominated for four of the comics industry's Harvey Awards. It's up for Special Award for Humor in Comics; Best Anthology; Best Biographical, Historical, or Journalistic Presentation; and Special Award for Excellence in Presentation. Team Cul de Sac was organized by Chris Sparks and inspired by cartoonist Richard Thompson, creator of the comic strip "Cul de Sac," which Richard retired when his Parkinson's Disease symptoms grew too severe for him to continue. It's an anthology of drawings by other cartoonists playing in Richard's sandbox--interpreting his characters in their own styles, mashing them up with their own characters, etc. Sparks found some of the best cartoonists around, most notably drawing out "Calvin and Hobbes" cartoonist Bill Watterson to contribute an oil painting. "Cul de Sac" and Richard's talent were so admired and respected (I wrote my own appreciation of "Cul de Sac" last August) that filling a book with the work of admirers was easy, and I feel lucky that mine was accepted. Proceeds go toward Parkinson's research, and I believe the book has raised more than $100,000 so far. Other Harvey nominations that caught my eye were my friend Raina Telgemeier's book Drama for Best Original Graphic Publication for Younger Readers, as well as two books from my publisher Abrams, The Carter Family and My Friend Dahmer, competing in the Best Graphic Album Original category. They're both excellent, and deciding which gets my vote will be hard. I also want to give a nod to Best Online Comics Work nominee "Nimona" by Noelle Stevenson, which I discovered when looking over the list of potential nominees and is the only one I've kept up with. It's a futuristic/medieval charmer. 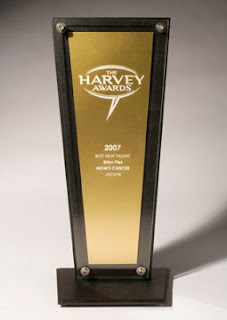 The Harvey Awards, named for cartoonist and editor Harvey Kurtzman, are nominated and selected by comics pros. I got one once. It's neat. For the past several years their awards ceremony has coincided with the Baltimore Comic-Con, as it will this September 7. The full list of nominations is here. My baseball team is better than your baseball team. When Karen and I go to a baseball game, as we did on Sunday, we drive our car to a ferry. and some always-impressive public works projects. Plus a dolphin and a sea lion. So, you know, it's already a pretty good day even before the boat gets to the ballpark. conveniently close to where our seats were. and has a very cute Despicable Me blimp floating overhead. After a good three hours sitting in the sun refreshed by cool Bay breezes, when my baseball team is done losing 4-1 to the despised Dodgers (despite my personal, repeated and heartfelt exhortations of "Beat L.A.!" and "we want a pitcher, not a belly-itcher! "), we get to thrillingly re-enact Alfred Hitchcock's "The Birds"
which courteously waits a half hour after the game to cast off, and go back the way we came. A perfect day? No. But definitely one of the great ones.